Here at Showpax we have a large and varied pool of resources which can meet many of your event labour requirements. Extremely valuable during build up and breakdown. On hand to assist with the unloading/ loading of vehicles thus helping to increase vehicle turnover and giving exhibitors more time to prepare their stands. 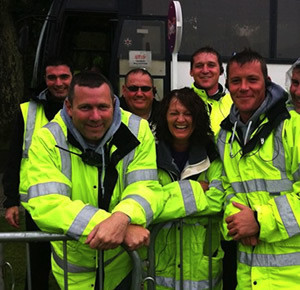 We recognise the need for efficient, friendly event stewards. Our staff will be fully briefed about all the aspects of your event and their courteous manner will help visitors enjoy the whole experience. An integral part of the traffic management team, we are aware that your delegates will be welcomed to your show by our marshals. Greeted pleasantly and dispatched proficiently your visitors will enjoy their brief encounter with the marshalling team. For events/ conferences where delegates arrive with luggage we offer a handling service. Our methods provide a paper trail that tracks the movement of each piece of luggage, making the ‘lost luggage’ problem a thing of the past. Which if required, will extend to room dropping the baggage to the correct room. We can supply reliable labour in many other areas too. Whether you need a team of hired hands or just the one, our conscientious staff will not let you down. For larger events or for a single lift, we can meet all your lifting requirements. Security: Whether you require a night watchman or a security team for a large outdoor event. Our fully licensed team will ensure your needs are met in a diligent manner.